Small dimensions in large series. Everything made of rubber. Welcome to our website! We would be happy to introduce ourselves: Lübke & Vogt is an owner-managed, medium-sized company for the mass production of small technical molded parts made of elastomer's of all kinds. Our product range is extensive and includes a wide range of technically sophisticated rubber molded parts for industrial applications. 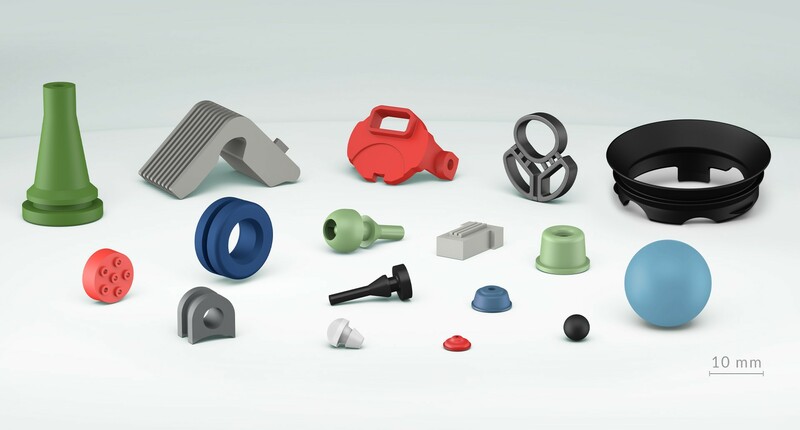 Our main product groups are seals, grommet, switch caps, grommets, buffers, dampers/plugs, special parts for special applications, balls and 2K parts. Since the founding of the company in 1968, we have retained the flexible structures of a medium-sized family business. Our core competencies continue to be technical molded rubber articles in small dimensions. We owe our entrepreneurial success to our consistent concentration on the essential, short decision paths, flat hierarchies, a highly qualified team and an innovative corporate culture that combines quality orientation with innovative power and maximum customer proximity. About 400 employees are involved in ensuring that the wishes and requirements of our customers all over the world are fulfilled with a high degree of professionalism. We have been manufacturing precise, small rubber molded parts for 50 years. Initially as a one-man business with a craft orientation, today as a medium-sized world market leader and internationally recognized manufacturer of quality "Made in Germany".